Hanoi, (VNA) – Prime Minister Nguyen Xuan Phuc has stressed the need for the Vietnamese and Lao Parties to enhance cooperation, exchange information and share experience in Party inspection, and strengthen the corruption fight. At a meeting in Hanoi on August 23 with Lao Deputy Prime Minister Bounthong Chitmany, who is also Chairman of the Lao People’s Revolutionary Party Central Committee’s Inspection Commission and General Inspector, the PM lauded the cooperation between the two Parties’ inspection committees. He said the two parties and governments attached great importance to Party reorganisation and the fight against corruption. Vietnam and Laos should continue to coordinate in organising anniversary activities until the end of the year so that the Vietnam-Laos Friendship Year 2017 profoundly impacts the people of the two countries, especially young generations. 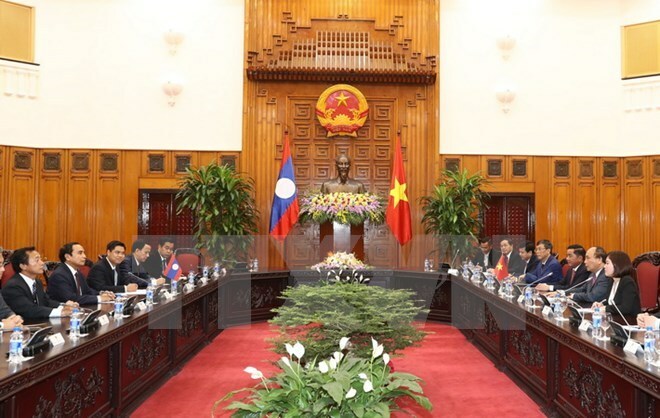 He thanked the Party, State, Government and people of Laos for supporting the Vietnamese community in Laos and expressed his hope that Lao leaders will continue to create favourable conditions for Vietnamese enterprises to do business in Laos.